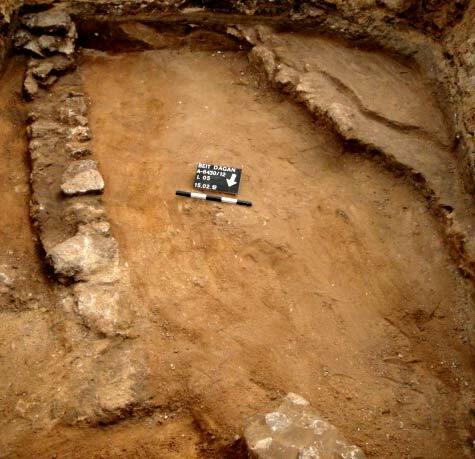 During February 2012, an excavation was conducted at Bet Dagan (Permit No. A-6430; map ref. 184006–31/656615–39), in the wake of discovering ancient remains prior to the construction of a synagogue. The excavation, on behalf of the Israel Antiquities Authority, was directed by S. Yechielov, with the assistance of E. Bachar (administration), F. Volynsky (preparing the area for excavation), H. Ben-Ari (surveying and drafting), A. Gorzalczany (field photography), P. Gendelman (ceramics) and M. Shuiskaya (pottery drawing). Excavations and surveys had previously been conducted at the site and finds ranging in date from the Intermediate Bronze Age until the British Mandate era were discovered; the tell itself has not been excavated (HA-ESI 124). 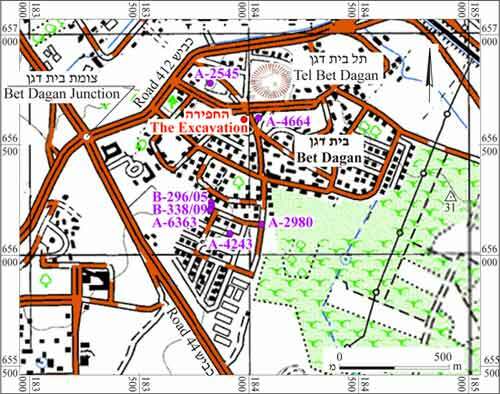 Two excavation squares (A1, A2) were opened at the corner of Menachem Begin and Rambam Streets, south of Tel Bet Dagan (Figs. 1, 2). Meager architectural remains from the Ottoman period, which probably belong to the Arab village of Beit Dajan that was situated on and around the tell until 1948, were exposed. The remains in the excavation were severely damaged as a result of modern infrastructure and construction. Square A1. 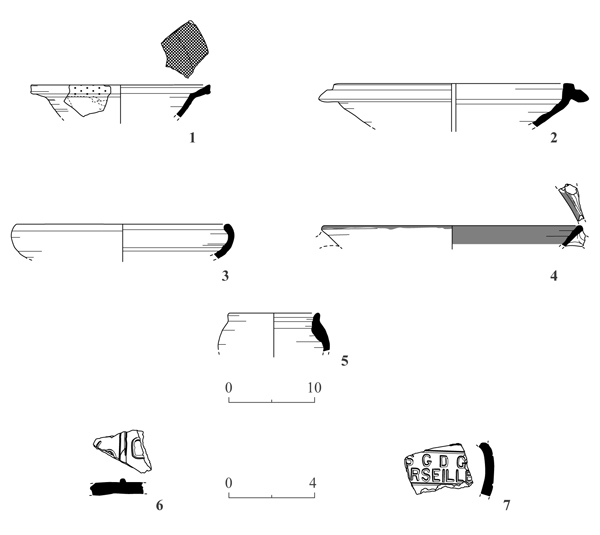 Three sections of walls (W1–3; Fig. 3), oriented northwest-southeast, were exposed. Wall 1 (length 3.4 m, width 0.5 m) was built of partially hewn, medium and large stones set on sandy soil and preserved to a maximum of five courses high (0.7 m). Wall 2 (preserved length 1.6 m) was built of fieldstones and survived a single course high. Wall 3 (preserved length 0.76 m) was built of small and medium fieldstones and survived to a maximum of five courses high (0.6 m). A layer of stones that served as a roadbed for a modern street that passed nearby was discovered adjacent to W3. The excavation in the square yielded scant ceramic finds from the eighteenth–nineteenth centuries CE, which date the walls and include bowls (Fig. 4:1–3), a frying pan (Fig. 4:4), a store jar (Fig. 4:5) and fragments of roof tiles (Fig. 4:6, 7). Extremely worn potsherds that probably predate those discovered in the square were found in the foundation trench of W3. Square A2. 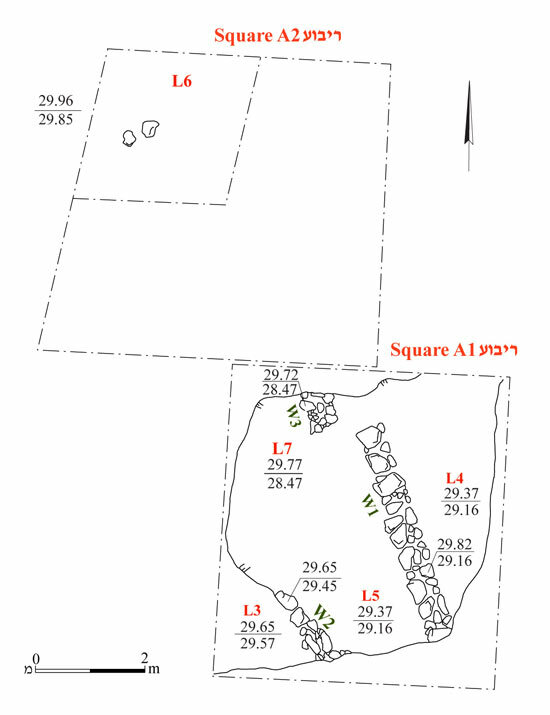 Fieldstones scattered in disorder in the northwestern corner of the square were discovered. It seems that the stones were strewn there during the installation of modern infrastructures. 3. Square A1, looking southeast.